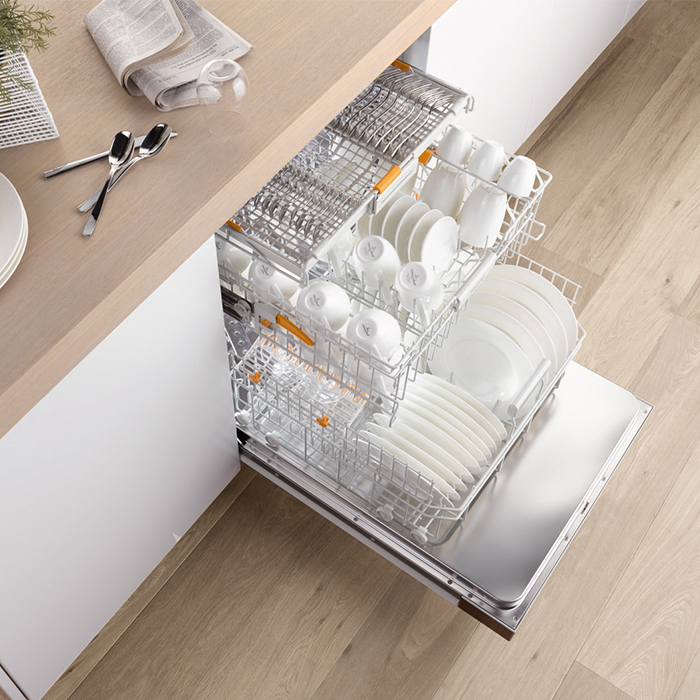 The Miele G6620SCWH is a top of the range dishwasher that is efficient, easy to use, quiet and extremely reliable. Miele is a German company that is still family owned that specialises in high-quality appliances. As most Miele owners will tell you its products last for years on end and the brand regularly tops customer reviews. The Perfect Glasscare program counters the effects of soft water on glass, ensuring that they are washed gently. A QuickPower wash delivers an A-rated cleaning and drying performance in less than an hour, while the Sensor Dry function ensures the optimum drying results. With an energy rating of A+++, the G6620SC is 10% more energy efficient than the traditional A+++ energy rating. This ensures that you use minimal energy, helping the environment and lowering your household energy bills. The economic performance is enhanced by the automatic load recognition which adjusts the use of water and electricity accordingly. As a result, you don’t need to wait for the dishwasher to be full to run a cycle. In addition to the six programmes, you can select the half load or short option so that you can perfectly tailor the programme for the amount of crockery you have to clean or the length of time that you want to run a cycle. What’s more, the Auto Sensor feature will monitor water cleanliness and adjust settings automatically to provide optimum water and detergent efficiency. The sensor wash programme uses as little as 6.5 litres of water, saving you money on your energy bills. 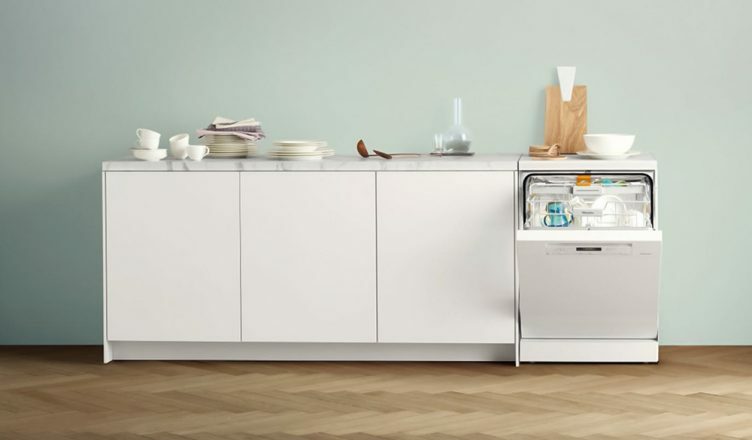 At 44dB, this Miele dishwasher will clean your plates and mugs whilst emitting minimum noise emissions. This model comes equipped with a height-adjustable upper basket and a top-mounted cutlery tray that can be adjusted to allow room for tall wine glasses below. In fact, you can configure the baskets in this machine any way you please. There’s a basket at the bottom and a height adjustable basket at the top. This allows 28cm plates in the bottom basket as standard, rising to whopping great 31cm dishes if you lift the basket to its highest setting. The act of lifting the basket is made simple with easy side clips. Both baskets roll out smoothly on multiple wheels (4 each side on the lower basket). Rest assured that your forks, knives and spoons will receive the most efficient wash possible in the 3D cutlery tray. You can arrange your entire cutlery on the top tray of the appliance, leaving you more space in the bottom for pots and pans after a big family dinner or after having guests over. You can also be sure that dishes will be ready to put away when the cycle has finished with the AutoOpen drying function. At the end of the cycle, the dishwasher door automatically opens 10cm to allow steam to escape and cool air to circulate around your crockery and cookware. There is a solid and weighty feel to the door as you open it and as it closes with a soft click. Running the machine is no more complex than closing the door, scrolling through the five programmes and pressing start. For added peace of mind, the appliance has been tested for the equivalent of 20 years use so that you can use it with confidence. So there you have it: a top of the range dishwasher that is efficient, easy to use, quiet and extremely reliable. Enjoy free delivery when you buy online today, use our Click & Collect to collect in just one hour or visit your local store for expert advice and service.